Buon giorno and welcome to our Travel Blog! RomeCabs provide many Port Transfers from Rome to Civitavecchia, and quite often cruisers opt to spend some time in Civitavecchia pre or post cruise. Civitavecchia is not exactly a top tourist destination, but if you find yourself there, what is there to see and do in this seaside town that welcomes cruise ships in its port from all over the world? In this blog post we show you some fun things to see and do in Civitavecchia. Civitavecchia is a modern seaport town on the shore of the Tyrrhenian Sea, but like the nearby Rome, it too has ancient roots dating back to the Etruscan times. True to its name, Civitavecchia (“ancient town”) is an ancient town. After the Etruscans were absorbed by the Romans, Emperor Trajan built the harbor during the early 2nd century by the name of Centum Cellae that reached its peak of its magnificence in the Imperial age. The harbor changed hands by the Middle Ages when it was taken over by the Byzantine in 537, and then conquered by the Saracens in 828 who used it as a military base against Rome. The refugees fled and rebuilt a new settlement in the mountains, and when the Saracens deserted the coast some 60 years later, the inhabitants returned and renamed the town Civita Vetula…the name that evolved into Civitavecchia. In 1432 Civitavecchia became a part of the Papal States until it was finally liberated under Pope Innocent XII in late 17th century only to occupied by the French in mid 19th century. In more modern times it surviving severe World War II bombings and eventually it was transformed into the modern main port of Rome that welcomes cruise ships and ferries. 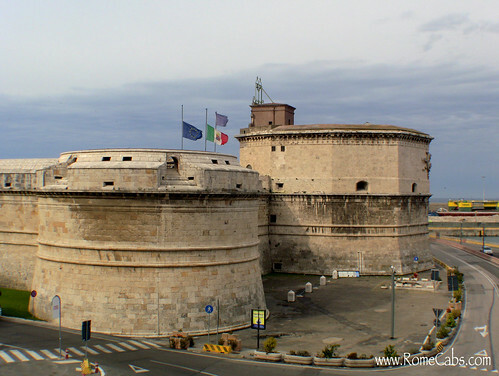 Upon arriving at Civitavecchia you will notice the imposing quadrilateral Renaissance era fortress with four corner towers, Forte Michelangelo (Michelangelo’s Fortress). It was commissioned by Pope Julius II in 1508 (the same pope who initiated the construction of the New St Peter’s Basilica over the Old St Peter’s Basilica and commissioned Michelangelo to create the Sistine Ceiling frescoes) to Bramante (the renowned architect who also worked on the New St Peter’s Basilica) in order to defend the port of Rome and its citizens constant threat of pirates and other invaders by sea. Bramante did not live long enough to see the completion of the fortress, but the work continued under the supervision of his pupils Antonio da Sangallo and Giuliano Leno. The fortress gets its name from Michelangelo due to his designs for the upper part of the main “male” octagonal tower. The fortress was completed under the guidance of Pope Paul III in 1537. Each bastion was given a name of a saint: San Giovanni, Santa Ferma, San Colombano and San Sebastiano (which has an underground secret tunnel as an undetected escape route). Upon its completion, this fort covered in travertine stone was the largest built during that era. 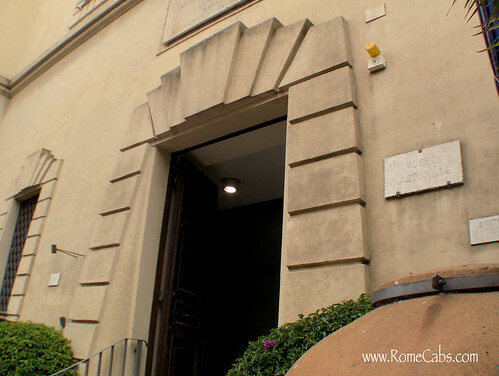 The museum, located a short distance from the main road Viale Garibaldi, is situated in an 18th century garrison. Inside you can discover ancient finds from the ancient Roman Centum Cellae, as well as the necropolis from surrounding area and artifacts from Terme Taurine (also known as Trajan’s Baths). 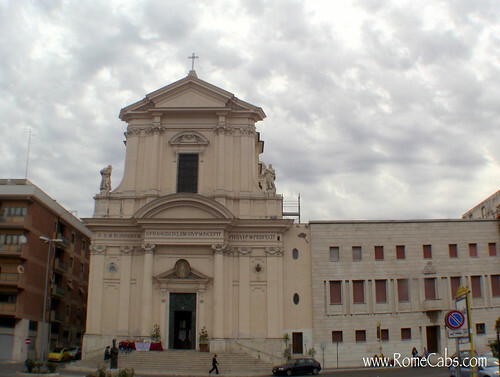 This elegant 18th century Baroque cathedral dedicated to St Francis of Assisi was rebuilt over a smaller pre-existing church from early 1600’s. In 1630 a defensive wall was built near the fortress to separate the port from the city and protect the citizens from enemy attacks. 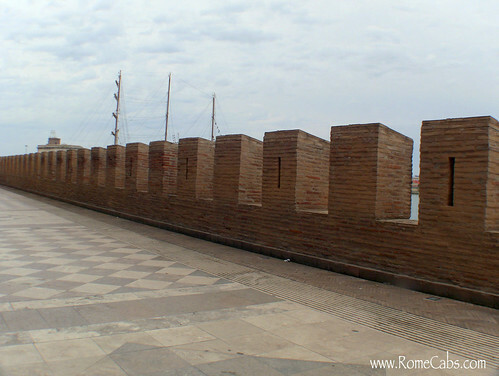 Today you can walk along this wall for a splendid view of the harbor. Easiest access to it is taking the stairway next to Mc Donald’s and then keep on walking. The wall is connected to modern buildings, and you will find cafes and restaurants along your stroll on the fortified wall. You can enjoy a beachside stroll along the promenade that stretches along a sliver of palm tree lined beach. You’ll find benches to sit and enjoy the sea view, pretty flower beds, sculptures, and various amenities to make your stroll more enjoyable. Grab a gelato from any of the nearby cafes, and savor the moment. For more Useful Tips including Places to Eat, Shopping, Financial Centers, etc., please click HERE. Thank you for reading our blog. 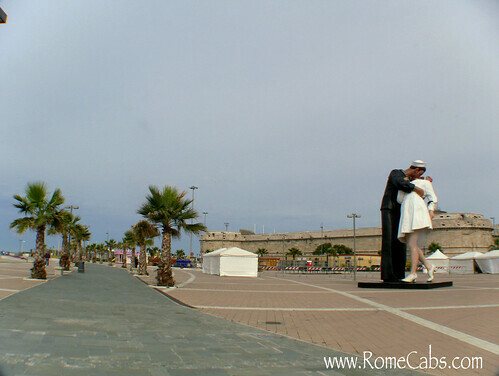 For more information on Port Transfers and Shore Excursions from Civitavecchia, please visit us at www.RomeCabs.com. We look forward to hearing from you! Do YOU have any favorite things to see and do in Civitavecchia? We’d love to know in the comment box below. Sharing is fun: If you enjoyed this blog, please share with others who might find it useful.